MKT BAR at Phoenicia Specialty Foods Downtown is proud to be a participant in Houston Restaurant Weeks from August 1st through September 30th, 2017. Houston Restaurant Weeks is the largest annual fundraiser for America’s largest food bank, the Houston Food Bank. Restaurants across Houston will donate proceeds from their special HRW menu sales to benefit this vital, community organization. During the five week dining experience we will offer specially priced lunch and dinner menus as well as a tasty HRW brunch menu. Give us a visit during this exciting time of the year to be a food lover in Houston! Go global and give back this holiday season at the second annual YUMMY! Wonderland at our downtown location on Saturday, December 3 from 9 a.m. to 2 p.m. Celebrate the season with an international holiday festival and brunch highlighting art, music, traditions and customs from around the globe. There will be activities to entertain everyone in your family with crafts, holiday wine pairing, cultural performances and live music. This year, you can take also decorate cookies and ornaments with Mrs. Claus and her elves. Bring the family to enjoy a day full of food, crafts, live musical performances and shopping while snapping photos with Santa. The event is free of admission and open to the public, with option to purchase food. Registration is highly recommended as tickets are limited. Reserve your tickets at yummywonderland2016.eventbrite.com. An international selection of à la carte entrées, brunch plates and desserts will be available for purchase in the market providing a culinary journey of delicious global dishes that are served during the holiday. Attendees can also enjoy sampling throughout the market for further exploration of international flavors. Let your creative side out to play! Families can create memories with hands-on crafts including cookie and ornament decorating stations with Mrs. Claus and her elves. You can also share your holiday wish list with Santa in French or English. And, since the holidays are the perfect time for merriment and “cheer-fullness,” adults can enjoy holiday wine pairing with chocolate, cheese and other holiday treats. You can also join the Houston Fire Department’s Operation Stocking Stuffer and celebrate the spirit of the season with a new, unwrapped toy to donate. Find gifts with heart from The Community Cloth, a local organization selling artisanal hand-crafted products locally made by women who come from Afghanistan, Bhutan, Congo, Iran, Iraq, Myanmar (Burma) and Sudan. In addition, the Houston Institute for Culture East End Studio Gallery will showcase handmade crafts from Mexico and hand painted dolls to decorate the Christmas tree with among many other retail vendors displaying artifacts from across the globe. GO TEXAN is more than just boots and barbecue. It’s a state of mind. From February 23-27, Phoenicia Specialty Foods and MKT BAR are celebrating the finest foods in Texas like the Hogtied Hamburger, complete with smoked gouda and ranch dressing or the MKT Frito Pie that’s got a nice little kick to it. Cool down some of that Texas spice with a Michelada or take a spin on the Buffalo Bayou Beer flight. And because everything’s sweeter in Texas, save room for our Mile High Key Lime Pie. MKT BAR is country music headquarters during GO TEXAN week, showcasing the best in local music from many of Houston’s most talented musicians. It’s live music and grub with a country kick from February 23-27. Between our great grub and toe-tapping country music, there’s simply no other place to GO TEXAN this February. Available Tuesday, February 23 – Saturday, February 27 at MKT BAR. The regular MKT BAR dinner menu will also be available. You can always take the taste of Texas home with you, too. Stroll on over to the butcher shop and pick up our Peppercorn Rubbed Pork Tenderloin, Phoenicia Bratwurst and Garlic & Herb Sausage on a stick and Cayenne Cheddar Burgers. Two-step your way into the market for a variety of local items like pickles, barbecue rubs and sweet Texas treats. Reality is a mental labyrinth / ignorance, its linear beast. When ignorance fuels destruction / history, strategically repeats. Awareness of awareness / elevates the dreamer from its sleep. Dare to dream awake / encourage memory beyond illusionary feats. If knowledge is power / grant wisdom to reign supreme. Unearth your history / from this labyrinth we dream. Ye are stars / reality sets free. Love is the path / imagination has its doors / transformation, your key. Santos Guerrero’s compositions blend inter-dimensional time/space narratives to create surrealist landscapes, often centered around anti-form line compositions. He employs a vast range of techniques from oil-based, acrylic, industrial and aerosol paints to avant-garde forms involving various forms of medium-applications, all with a keen eye for the emotive power of color. The opening reception on February 19th from 8PM-midnight features a music line-up including Wonky Powers recording artist George West and deejay FREDster with special guest, multi-platinum music producer The ARE, whose credits include work for LL Cool J, Nicki Minaj and Houston’s own K-OTIX, whose latest album features cover art by Guerrero. In honor of the artist’s hometown of Monterrey, Mexico a Santos-inspired ceviche and michelada will be available for purchase at the opening reception. All artwork will be available for purchase and the artist will be in attendance at the opening reception. On Saturday, February 13th, all of Cupid’s single and hitched friends can enjoy Cupid’s Cuddle Fest Karaoke at MKT BAR. From 7-10PM, DJ Tempty will spin soulful love tunes, followed by cuddly karaoke emceed by the Rosewood Thievz. At midnight, all the single ladies (and men) are invited to sing their hearts out in the first annual “#CuddleMe Singles Sing-off” to be crowned “#CuddleFest Karaoke King and Queen.” The Royal couple will close the night with a romantic duet. 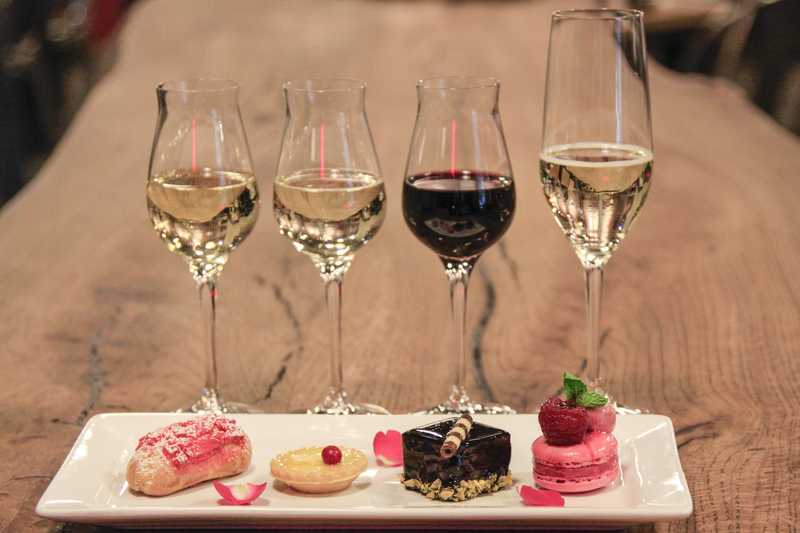 Share a Valentine’s Tasting for 2 which features 4 mini desserts, each paired with wine. The kid’s meal special is available for kids under 12 years old and includes a heart-shaped pizza, drink and cookie kit. Standard MKT BAR menu for kids is also available. On Sunday, February 14th, Houston’s favorite crooner Bryan Anthony and The Gentleman’s Club will be playing live from noon-3PM. Phoenicia Specialty Foods is your one stop shop for gifts for every type of person in your life: The Foodie, The Kiddos, The Wine & Beer Lover, The Coffee & Tea Addict, The Health Nut and The Sweet Tooth. See Phoenicia’s Valentine’s Gift Guide (PDF) for complete details. On December 31st, MKT BAR is ringing in 2016 with a New Year’s Eve Soul Celebration with the live funky sounds of Jordan “Chili Sauce” Donald saxophone and vocoder extraordinaire and DJ Tempty. Delicious MKT BAR bites will be on hand throughout the night, and at midnight, guests can expect Hill Country Chicken & Waffles and artisan pizza paired with a champagne toast. VIP tables will be available and include champagne bottle service, and New Year’s Eve party favors. Ages 18 and up. Pre-sale tickets are available for purchase online until December 31st at 6PM. Please note: VIP Table guests must also purchase general admission tickets separately. Tickets for entry are not included in the VIP Table price. Our popular Hill Country Chicken & Waffles is half off all day from 10AM-8PM. Celebrate global customs and cuisines under one festive roof at Phoenicia Specialty Foods, Saturday, December 12th, from 9 a.m. to 3 p.m. at YUMMY! Wonderland. Bring the family to Phoenicia’s downtown location and enjoy a day full of food, crafts, live musical performances and shopping. Join the Houston Fire Department’s Operation Stocking Stuffer and celebrate the spirit of the season with a new, unwrapped toy to donate. Tickets are $15 for adults and $8 for children (ages 4-12). Buffet-style brunch, house coffee and juice are included with the ticket price. Seating is first come, first served and brunch will be served from 9 a.m. – 3 p.m.
Houston Rockets games & giveaways, plus a possible appearance by mascot Clutch. Find gifts with heart from The Community Cloth, a local organization selling artisanal hand-crafted products locally made by women who come from Afghanistab, Bhutan, Congo, Iran, Iraq, Myannar (Burma) and Sudan. What’s on your holiday wish list? Let Santa Claus know during the celebration. Santa speaks French and English and photo opportunities are available. Get ready for an evening of ghostly goodies and festive fun at MKT BAR on Saturday, October 31st from 7PM – 1AM. Nosh on spook-tacular snacks with party potions available at special prices. Partygoers are encouraged to dress up in their best costume for a chance to win prizes and be ready to dance the night away. $12 VIP admission includes light bites & festive fun. General admission -free ticket- is to enjoy the festive fun. Halloween-themed drink specials and desserts will be available for purchase. Witness a collection of live music photography and portraits. “Shooting Stars” is a powerful exhibition from the past seven years, documenting national and international acts as well as the rise of Houston’s vibrant and emerging music scene. Trish Badger is a Houston-based photographer whose career is built upon an extensive range of portrait, music, commercial and event photography. She has been capturing live music in venues large and small for the past seven years. Her keen eye behind the lens and passion for music have given her the opportunity to document some of the world’s most prestigious musicians, while at the same time being an outspoken champion for Houston’s music scene. All artwork will be available for purchase. Exhibition organized by Jonathan Bietler. COST: Free admission. Food and drinks will be available for purchase.